Ahed Tamimi (right) and her mother Nariman were released from an Israel prison Sunday. They had served dual eight-months sentences. Ahed, a 17-year-old teenager, left her cell and found a wild reception from friends, family and townspeople of her Nabi Saleh community. Before her day of release ended, Ahed had held a press conference for the world’s media, was welcomed home by Palestinian President Mahmoud Abbas, and laid a wreath at the grave of Palestine’s first president, Yasir Arafat. In her quiet, polished manner, Ahed also gave Israel what it dreaded, a heavy blow to its already-staggered public image of what is now a self-named Jewish state. She has become a symbol of both Israel’s 70-year Occupation, and Palestine’s future, by quietly serving her eight-month sentence for slapping an Israel soldier. Maan wrote: “Palestinian Liberation Organization (PLO) Executive Committee Member Dr. Hanan Ashrawi welcomed the release of the 17-year-old Palestinian Ahed al-Tamimi and her mother, Nariman, who were held in Israeli prisons for the last eight months. Ashrawi said in a statement that “Ahed and Nariman, both prominent Palestinian activists, were wrongfully and unjustly imprisoned by Israeli occupation forces in December. The motive for their vindictive arrest was political- Ahed, who is underage and turned seventeen behind prison bars, slapped an Israeli soldier who showed up with dozens of others to invade her family’s home in Nabi Saleh, and Nariman filmed the incident. “Ahed and her humanity captured the imagination of many people around the world because of her spirit and refusal not to be intimidated by Israeli soldiers.” Ashrawi said that Ahed’s story, and the stories of her courageous relatives, expose not just the “immorality” but also the “cowardly nature” of Israeli forces. Mondoweiss describes Ahed’s release from jail as an “incomplete freedom”. She moves from one prison back to another, occupation. The slap that sent her to eight months in an Israel prison, was filmed. It went viral. Her mother “was imprisoned for live-streaming the incident on Facebook”. The Israeli response was hysterical. 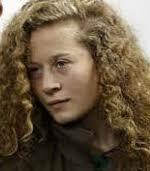 Education Minister Naftali Bennett suggested that Ahed spend the rest of her life in prison, and ‘centrist’, ‘liberal’ journalist Ben Caspit suggested that “we should exact a price at some other opportunity, in the dark, without witnesses and cameras”. Lawmaker Oren Hazan (Likud) said that if it were him, he would “put Ahed in hospital” by kicking her in the face, and author of the IDF ‘ethics-code’ Asa Kasher backed her continued imprisonment because she could, God forbid, slap again. American academic and prolific writer, Juan Cole, delivered the news in his precise and colorful manner. Tamimi, as a 17-year-old girl, slapped a couple of Israel Occupation personnel attempting to barge into her home. She and others had participated in a demonstration against Israelis squatting nearby on Palestinian land and encroaching on her home town, during which there was some stone throwing at the Israeli troops who came to stop people from protesting. Those troops shot her cousin in the head with a rubber bullet. That was when Ahed went out and slapped them. Completing high school in jail did not come without a struggle. Tamimi said she plans to go to law school and that she hopes to specialize in human rights law so that she can defend Palestinian activists and prisoners on the international stage. Juan Cole concluded his report with a strong suggestion that international supporters of a free Palestine, as well as believers in justice, should find a way to start a law school fund for Ahed Tamimi. Israel lurks in the shadows waiting for its chance to return this brave teenager to prison. Ahed will need all the help she can find to smash those barriers Israel will place in her way. Juan Cole writes that he is ready to contribute to Ahed’s law school fund. Do I see hands raised to join him? The clip above is from TRT World, a Turkish international news channel broadcast 24-hours per day in the English-language. The news channel is based in Istanbul, Turkey.